Route 66, more myth than reality, offers travelers and adventurers unprecedented opportunity for adventure. And that is most likely the understatement of the year. However, in increasing numbers enthusiasts are discovering that the opportunities for memory making adventures are not limited to driving the double six or attendance of festivals. They are modern pioneers who have decided to make the Route 66 experience something lived daily. 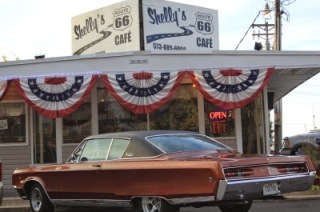 They are the business owners, the daring visionaries who relight the neon, make the pies, and ensure the Route 66 experience is seasoned with vibrancy, color, and inspirational passion. Scattered among them are the veterans, the families that have met the needs of travelers on the double six for generations. With that as an introduction, I would like to thank each business owner that has made our trips along Route 66 so enjoyable. Here are but a few of our favorites. What are your favorite stops?